Things get spooky in the new trailer for season 13 of It’s Always Sunny in Philadelphia. In the show’s tradition of riffing off popular culture for its promo material, this teaser, titled “Paranormal Paddy’s,” seems to tap heavy into the ‘found footage’ aesthetic made popular with films like Paranormal Activity. While (most of) The Gang sits at the corner of Paddy’s bar, a few supernatural occurrences go down, and go completely unnoticed by our heroes. You can see the trailer in the post below! 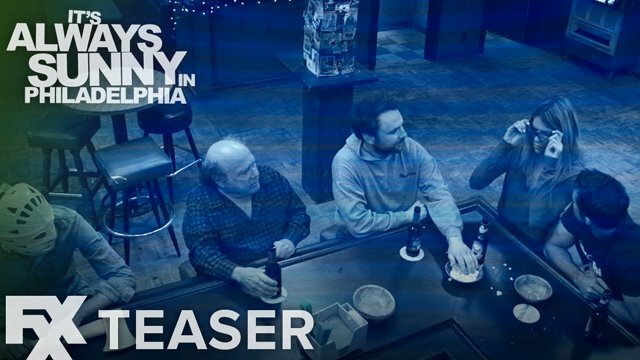 The Gang returns–mostly–in the 13th season of the FXX original comedy series It’s Always Sunny In Philadelphia, Mac (Rob McElhenney), Charlie (Charlie Day), Dee (Olson) and Frank (Danny DeVito) return to their duplicitous, scheming ways at Paddy’s Pub, while Dennis (Howerton) takes on the new role of father in North Dakota. Even without Dennis Reynolds, the Gang has its hands full as Charlie hopes to have a child with The Waitress, Mac sets out to understand his newfound sexuality, Dee takes feminism to new heights and Frank goes to great lengths for the Gang to experience the greatest moment in Philadelphia sports history – an Eagles Super Bowl victory. Even though only four members of The Gang appear the new trailer, it was confirmed earlier this month that Glenn Howerton would be returning to the series in its 13th season in his role of Dennis, who had seemingly made his exit in the previous season finale. It’s Always Sunny In Philadelphia season 13 will premiere on September 5, 2018, on FXX. The post It’s Always Sunny In Philadelphia: Things Get Spooky in the New Teaser appeared first on ComingSoon.net.